Hot Chelle Rae is a pop band formed in Nashville, Tennessee, in 2005. 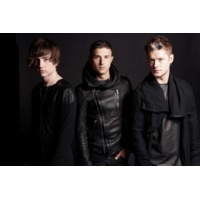 The band consists of Ryan Follese (lead vocals, guitar), Nash Overstreet (lead guitar, vocals), Ian Keaggy (bass, vocals), and Jamie Follese (drums). Their debut album, Lovesick Electric, was released on October 27, 2009. Hot Chelle Rae began in 2005, with a meeting between singer-songwriter Nash and guitarist Ryan. Initially a case of polar opposites, the two began to warm up to each others styles and together they started a band called Miracle Drug. After several changes to the lineup, Ian (who had been childhood friends with Nash) came to a show and, after seeing that the band had a hired bassist, decided to join the band as their new bassist. Declaring that "If that guy can play bass, I can play bass". The three began working on songs together, and decided to head towards a dancier music sound. Jamie, R.K.'s younger brother joined the band immediately after graduating high school, finishing out the band's lineup. The band is named for the first "dedicated" fan, Chelle Rae. A Myspace stalker who provided the band with quite an entertaining era of online activity until her false identity was discovered and brought to light. In the summer of 2007, the band opened a sold out concert for rapper Lil Jon. Later on that year, they played a string of venues at the prestigious South by Southwest music festival in Austin, Texas, and then went on tour with the band Vedera.